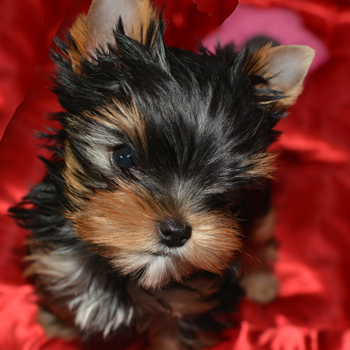 Below are pictures of some of our other puppies at Artistry Yorkies. If you have any questions, please don't hesitate to contact us by email below or by phone. Contact can also be made at the top of this page by clicking below Live Chat Or Leave A Message icon above. All inquiries are always welcomed. 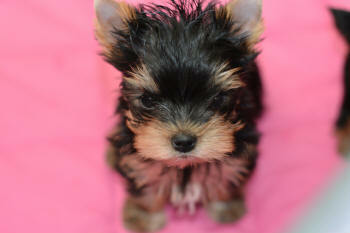 Meet some of our Yorkie puppies for sale. They are pictured below in our slide shows. 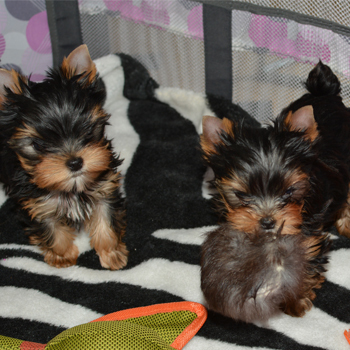 Both parents of these puppies are out of AKC Champion Yorkies. 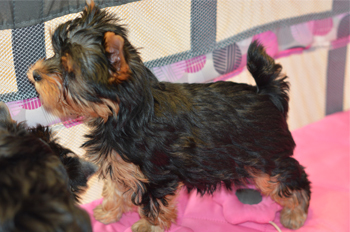 For more information on some of our puppies parents, visit our Champions page Yorkshire Terrier Champions. We breed our litters for our next show dogs and plan on keeping one of the girls in this litter for ourselves to show. 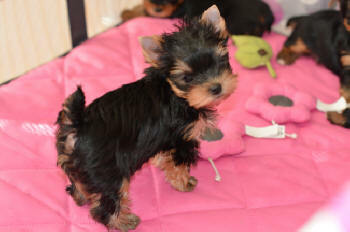 That type of breeding and pedigree makes for the best in quality and health for your next pet puppy as well. We only want the best for ourselves and health is of the utmost importance to us as we are sure it is to you as well. Conformation and looks are of course also important to us as well. We have had all champion litters in the past. 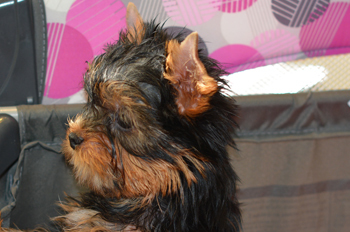 Many of the Yorkie puppies sold as pets that go to new homes are many times “show quality". 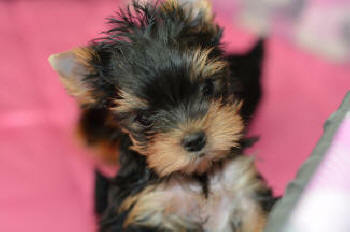 Contact us by email for current availability of our Yorkie puppies for sale. We can provide you with additional pictures including pictures of champion parents along with price. Please allow a few days to hear back from us, as we have a busy schedule with our jobs and our day to day family hustle and busle. If you do not hear back from us, please feel free to call us as well at 269-365-3894 to be sure that we received your email. 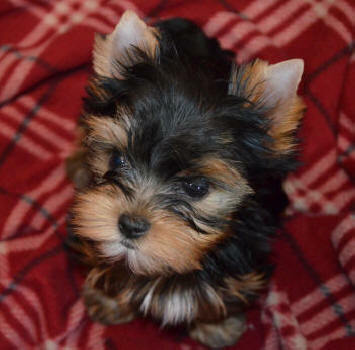 Tiny female Yorkie puppy. 2.5 lbs - 6 months old. Beautiful colored coat and silky texture. Adorable face and expressions. Too cute for words. AKC Champion Sire and AKC Champion Dam. Email for availability, additional pictures and price. 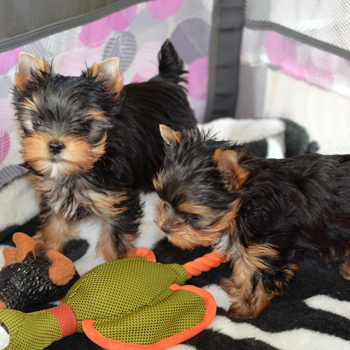 Tiny female Yorkies. Pictured here at 9 weeks. Not available to go until at least 12 weeks old and 2 lbs. 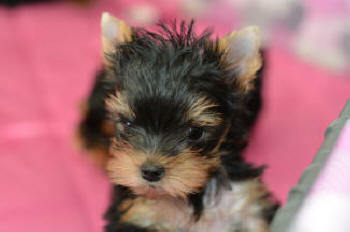 Adorable male puppy for sale. AKC Champion Sire and AKC Champion Dam. Beautiful face, excellent structure and beautiful coat and silky texture. Will be under 5 pounds as an adult. Email us for additional information and picture of parents. 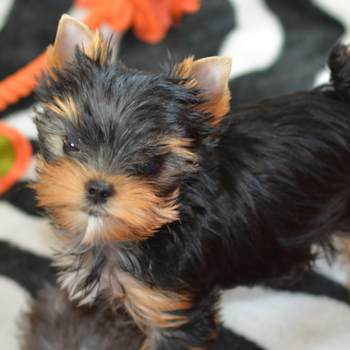 Yorkie puppies are probably one of the cutest puppies you will see. Able to sit in the palm of your hand as babies, they almost look like a little stuffed animal. 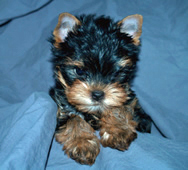 Depending on the quality of Yorkie puppy you get, will determine their adult size. Teacups being thought to be the smallest. 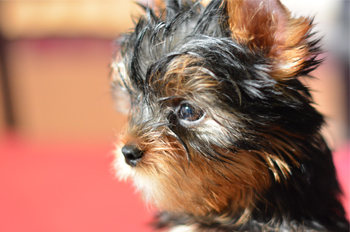 The term teacup is just a slang word used to describe very tiny Yorkshire Terrier puppies. It is not a different variety of the breed all together. 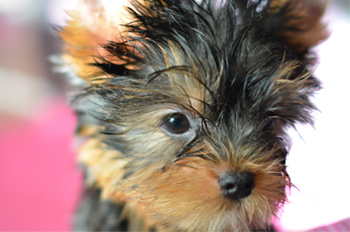 As Yorkie puppies mature and grow their coat and their black coat color starts to transforms into its adult color of a steel blue silky coat. Some turn silver while others keep their black coat and will not be a silk texture. 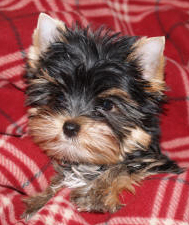 One thing is for sure, Yorkie puppies are simply adorable. Show dog owners keep the coat long and parted in the middle. The coat is shiny, smooth and silky. 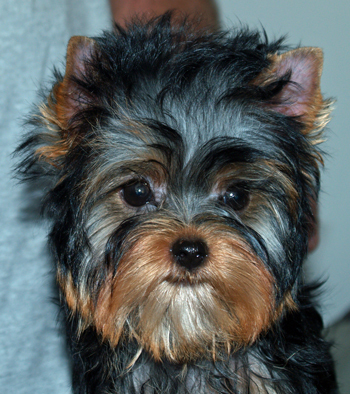 General Yorkie owners sometimes like to keep the coat short, allowing the dog more freedom and less snarling of the hair. 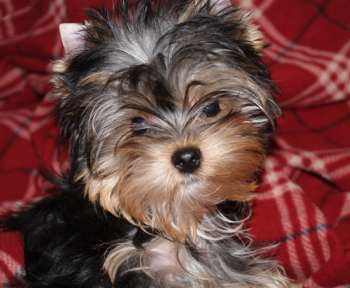 Yorkies do not shed which makes them highly desirable for those who hate dog hair on their furniture and clothes. As a pet, they can be playful and love just to be with you. They are great cuddlers. They are the best cuddlers after the age of 1 years old once puppy hood has passed. A lapdog by nature, as long as you are there they will sit there for hours and hours. Yorkies do not need a lot of exercise. And they are very, very, social animals. 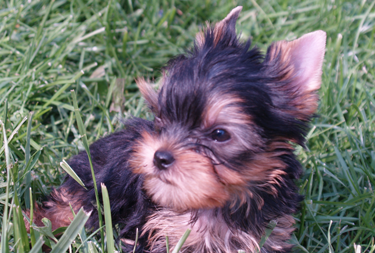 Yorkie puppies walk with confidence and an air about them. They are easily trainable and adapt well to different locations. They prefer adults or older children as they like to be the baby. They act very motherly around babies . They are very loving and loyal pets and bond quickly to the people who care for them and love them. They enjoy being a part of the family. 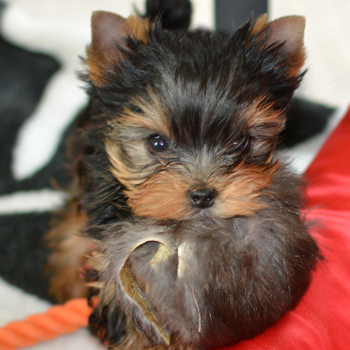 We hope you have enjoyed looking at pictures of some of our Yorkie Puppies. If you have any questions about puppy care or if you would like to inquire about what puppies we have available for sale, please don't hesitate to contact us. We welcome all emails and or telephone calls. Email us at showdogs@live.com or call us at 269-365-3894.